Gender-neutral bathroom sign in the guidance area. Students at Northampton High School have been working with school administration in the hope of having gender-neutral bathrooms installed on the third floor in 2018. The goal is to make gender-neutral bathrooms more available for gender-nonconforming students. Someone who identifies as gender-nonconforming is a person whose gender does not fit within the binary of female or male. 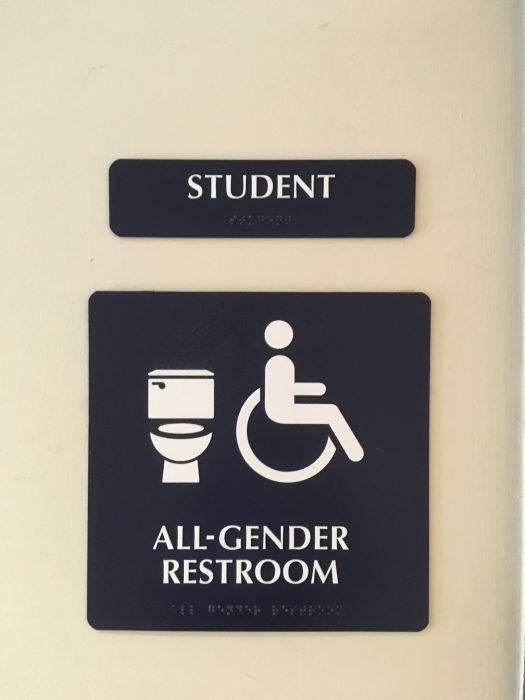 Gender-nonconforming students may not feel comfortable using the boys or girls bathroom and would benefit from gender-neutral bathrooms, according to Sylvia Shread (‘18), a leader of the Feminist Collective and member of the Gender Sexuality Alliance (GSA). At the high school, students are separated by gender structurally. Boys go to the left side of the building and girls to the right. However, if a student identifies as gender nonconforming, they can either use the bathrooms in the nurse’s office, signifying they are sick, or go to Guidance, signifying they need guidance. Shread described how making a change to “the structure of the school would represent our community values.” Not only does the placement of the gender-neutral bathrooms convey something is wrong with the students who use them, but the stark contrast of location between the different bathroom spaces isolates the gender nonconforming students, and actually affects their education. When gender-nonconforming students with classes on the third floor need to use the bathroom, they have to go to the first floor. They spend more time out of the classroom than those who feel comfortable using the binary bathrooms. The result, according to Shread, is that gender-nonconforming students do not have equal access to education. Remove signs above and next to bathroom doors. Place proper menstrual disposal trash cans in the original boys bathroom. Re-label bathrooms “Gender-neutral with urinals” and “Gender-neutral without urinals.” Both bathrooms will have signs made by art students above the doors, as well as braille signs next to the door. Announce the plan to the student body and NHS community, and then hold an educational forum with members of all clubs, as well as professionals who may understand the importance of gender-neutral bathrooms. Northampton High School’s Associate Principal Celeste Malvezzi confirmed the administration supports the Gender-Neutral Bathroom Proposal, and said they have already begun to change the single stall faculty bathroom on the third floor to a gender-neutral bathroom. This allows easier access and increased availability for students. Teachers will continue to use these bathrooms, in addition to any students who want to. Ms. Malvezzi made it clear this new gender-neutral bathroom is not necessarily in place of a multi-stall bathroom, and students are still free to advocate for the multi-stall gender-neutral bathrooms. Even though the Uniform State Plumbing Code of Massachusetts prohibits multi-stall gender-neutral bathrooms, Shread has been struggling to have more than one stall in the bathrooms for a long time. Many people share the same views as her, she says, and she wants to keep people’s minds open to the possibility. As rewarding and beneficial as her plans may be, they come with a high price tag. Installing more than one stall in the third floor boys’ bathroom would require removing all urinals and replacing them with stalls and toilets. Even considering the construction and high cost of what would have to be done to the bathrooms, Shread is determined to push for these changes and to keep minds open to their possibility. Last year, the Student Union surveyed the student body on their feelings about installing more gender-neutral bathrooms. The results were overwhelmingly supportive, although there was confusion around the specifics of the proposal. Shread suspects students and parents will have a bit of a push back but it has not happened yet. Administration has concerns they will receive complaints from parents about their children seeing another gender’s genitalia. Ms. Malvezzi has not heard much negativity from anyone about the gender-neutral bathrooms.